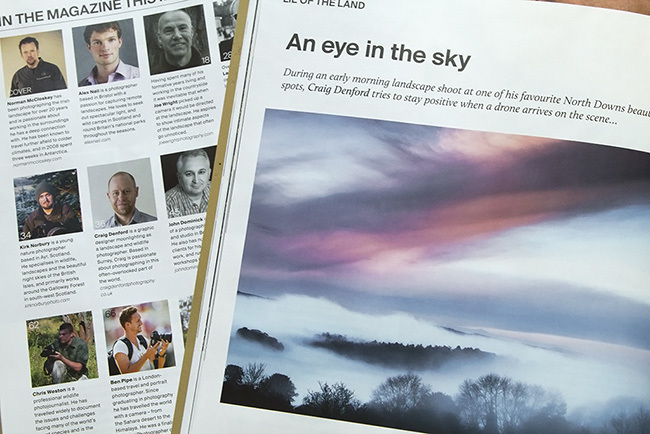 I’d photographed at Newlands Corner many times, it’s one of my favourite locations, but I’d never been lucky enough to witness a cloud inversion there. So it had been a long held dream to see and photograph one. On this particular morning I had intended to photograph at Box Hill, but I never quite made it. As I crested the hill at Newlands an amazing scene opened out in front of me. Box Hill would have to wait for another day. A ribbon of cloud obscured the early rising sun, but as the colour filtered through there were some lovely pastel tones. This was it, finally I could capture the kind of images I’d long hoped for. I carefully composed the scene, and began shooting. “This is incredible” I thought to myself. Mornings like this don’t come along very often. I even took a snap on my mobile phone to send to my wife. I do these things when I’m excited, and I’m sure she loves to be woken up to see a nice landscape. Then disaster struck. It began with a faint humming sound, becoming stronger and higher pitched as it got closer. Then there it was, a drone, RIGHT IN THE MIDDLE OF MY SHOT! I was powerless to stop it, and knew that from this point on cloning was going to be the only option. Are you allowed to shoot at these things?! I tried to look on the bright side. Minutes earlier I’d answered the call of nature (that morning cup of tea is a killer). Imagine if it had flown overhead whilst I was mid flow. Could I get arrested? Or would I simply end up on YouTube? I couldn’t quite decide which was worse. One thing I did know however, was that wetting myself would be worse than either of those things. So any worries of an Orwellian future, with the skies filled with prying eyes watching our every move, were soon cast aside. After all, when you’ve got to go, you’ve got to go! Congratulations mate on getting published in Outdoor Photography. Good read! Thank you Stephen, glad it raised a smile! Doing all I can to beat the drum for Surrey.